Your much desired and waited for honeymoon days are on their peak and you feel like making the most of them in a very special way. And then there is the question of making a proper choice of the most appropriate honeymoon destination. In such a case, you are not to worry at all as the vast and beautiful hills of Mussoorie await you with all that you desperately need on your honeymoon. Honeymoon in Mussorie has some of the most alluring attractions in its lap including the awesome Kempty as well as Jharipani Falls that tickle your fancy in the most amazing manner. In the list of waterfalls, you also spot Bhatta Falls as you pass the Mussoorie Dehradun Road. Another interesting sight that you both must witness is the Mussoorie Lake that delineates the serenity of Mussoorie. And if you have some inclination towards spirituality, then you both should together visit the famous Nag Devta Temple to receive the holy blessings for a happy married life. 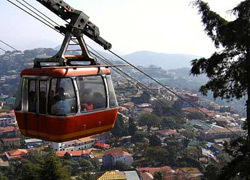 Other places that you must visit during your Mussoorie honeymoon tours include the Camel's Back Road and Sir George Everest House. And if you want to celebrate a special day for picnic, then you must turn your way towards the Van Chetna Kendra that consists of a variety of wildlife. Gun Hill presenting a marvelous view of the Himalayan Ranges and Municipal Garden, where you can indulge yourself in boating needs your visit. So don't spend even a minute in deciding upon your honeymoon destinations, since your Mussoorie honeymoon Packages has got everything that you seek to make your honeymoon a lasting and memorable experience. Free use of recreational activities except pool table. Complimentary pick up & dropping from mall road. Welcome you with a hot cup of tea with cookies on your arrival. Accommodate you in well appointed Premium Club Rooms. Provide you with a refreshment basket in room on your arrival. Provide you with in room Tea / Coffee makers for your requirement of tea and coffee. Cookies & fruit basket in the Room. Coupon worth 200 for video game parlour & Pool Table. Complimentary transfer to the Mall.